Another tea that I got from Teavana thanks to the Starbucks rewards program, I picked up this one the same day that I picked up Blooming Pineapple as I was curious about their blooming teas. At $19 for 2oz, this is not an inexpensive tea. With the free rewards, I picked up 1oz of this tea, which wound up netting me 5 balls of the Peach Momotaro tea. What really drew me to this tea is the fact that it smells exactly like fuzzy peach candy. 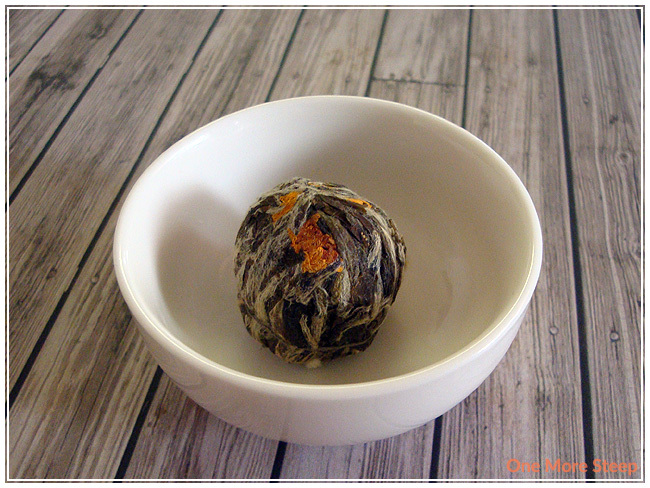 They’re quite well made balls, with a little peek of flower petals through the tea leaves. 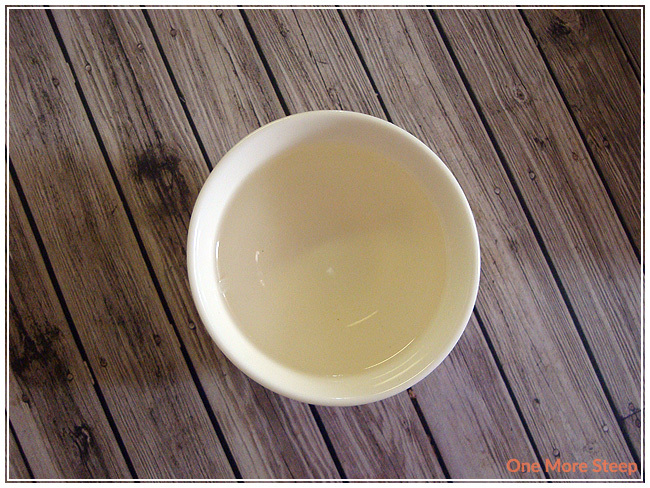 Peach Momotaro is made up of: white tea, marigold flowers, and artificial flavouring. And the smell is amazing. I can’t smell any of the white tea base though, but this really makes me want fuzzy peach candies. 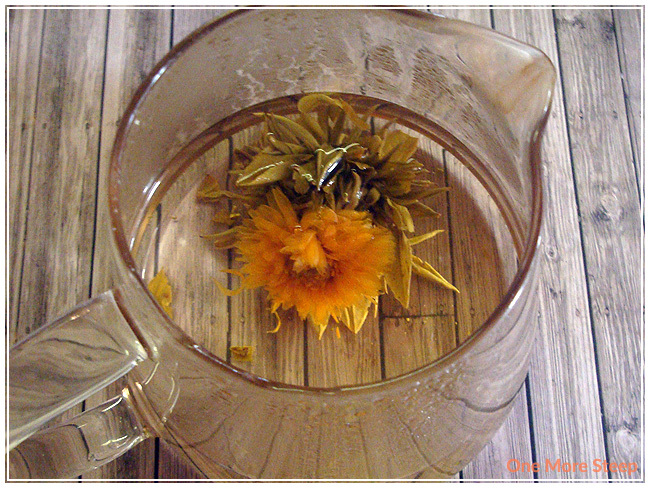 Teavana recommends using 1 ball and steeping in 82C (180F) water for 3 to 4 minutes until it blooms. It took almost the entire 4 minutes for my ball of Peach Momotaro to bloom. First off, the tea looks really pretty when it’s fully bloomed and it stayed pretty well intact. The tea itself steeps to a lovely pale yellow and it still smells like peaches but it’s not as strong as it was when the tea was dry. It’s not an overwhelming flavour at all – the peach taste is very light and not as strong as I expected with the great peach candy fragrance before. The tea itself is very pleasant – it’s not bitter at all and very smooth. I added a bit of sweetener to the tea and it does brighten up the taste of the peaches quite a bit and makes it more enjoyable. I resteeped the Peach Momotaro and found that the tea did fairly well for the second steeping. The peach aroma is less pronounced, but I’d chalk that up to the fact that it’s the artificial flavouring that was added. A bit more sweetener helps to bring out that peach taste though and it tastes lovely. It resteeped well for the third and fourth time as well. 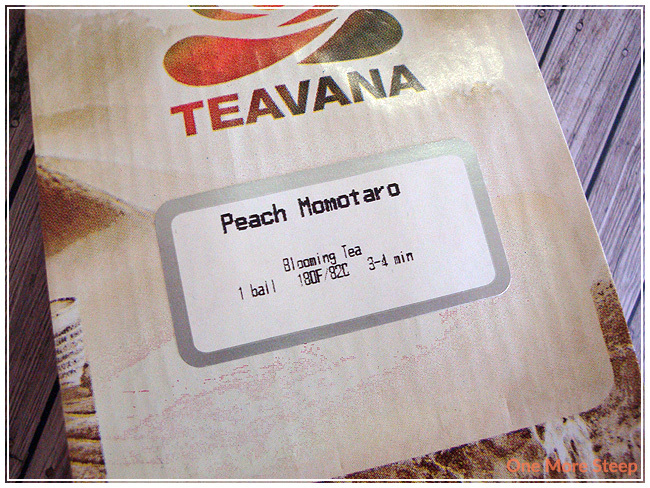 I loved Teavana’s Peach Momotaro. I just really enjoy blooming teas, and found this one to be really nice. I was a bit disappointed by the peach taste in the steeped tea compared to the dry tea, but that was something that could be remedied by the addition of a little sweetener. It is a very pretty tea to look at when it unfurls in the tea pot, if there was ever an argument to get a clear glass teapot, blooming teas would be it. I think it’s very enjoyable and resteeps very well – don’t forget to add more time with each resteep! Peach Momotaro is the more expensive side, especially when you consider the fact that if you were to buy 2oz, you’d get 9-10 balls only. But it does resteep, so you get quite a good number of uses per tea ball. It’s definitely a nice treat though, so if you have any Starbucks/Teavana rewards to use, this might be a good one to try out before committing to use your money to purchase a bag of it.